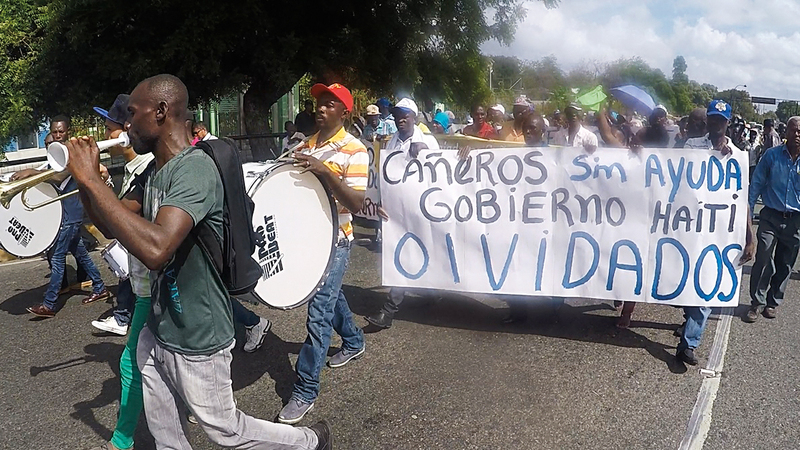 Sugarcane cutters protest outside the Haitian embassy in Santo Domingo on July 14, 2015, claiming they have been forgotten by Haiti. After living most of their lives in the Dominican Republic, many are now fighting to gain permanent residency there. Photo: Jheison Romain. As I neared the end of my field research in the Dominican Republic, while in a batey in the north of the country, I had a conversation with a 28-year-old black man who was born and raised in the Dominican Republic by Haitian parents. He and his two sisters are very ingenious entrepreneurs who have managed to pool limited resources to start a small business. Together, they sell delicious, freshly made passion-fruit juice and grilled ham-and-cheese sandwiches out of their small house. I shared with him that I was born in Colombia and he responded with delight that Colombia was one of three countries he had always wanted to visit. The other two, he said, were France and Africa. I corrected him, saying that Africa is not a country. He did not understand what I meant. I proceeded to explain to him that Africa is a large continent with 55 different countries and a vast diversity of cultures and languages. In his mind, he confessed, Africa had always existed as a single country. I could not fault him for this misconception. Despite having been born in the Dominican Republic, during a time when the constitution stated that anyone born in the country would have the right to citizenship, with the exception of the children of diplomats and people “in transit,” he was not able to obtain the papers that would grant him normative citizenship in the Dominican Republic, and, thus, he was not allowed to pursue much education. After the exchange, I wondered about how he had received this faulty information. How is it that he knew about Colombia and France as countries, but was not aware that, in his mind, Africa, the second-largest continent in the world, had been diminished to a single nation? How is it that a black man who is proud to be Haitian, and proud to be black, can have such a limited perspective of the continent from which his ancestors arrived? While thinking about this, I recalled the first reference to Africa that I heard upon my arrival in the Dominican Republic. When I presented my passport to the immigration officer, after inquiring about the purpose for my trip, he proceeded to ask me if I had traveled to Africa within the past month. Puzzled, I asked him why he wanted to know. He said it was because of the outbreak of Ebola virus in Africa. This, despite the fact that the outbreak had only affected three countries in the west of the continent. I wondered, did he also imagine Africa as a single country? This was not a question that the immigration officer had conceived on his own. Instead, it had likely been formulated by government officials who are in charge of policies regarding travel and migration. How might this institutionalized question also contribute to the minimization of Africa in the collective unconscious? 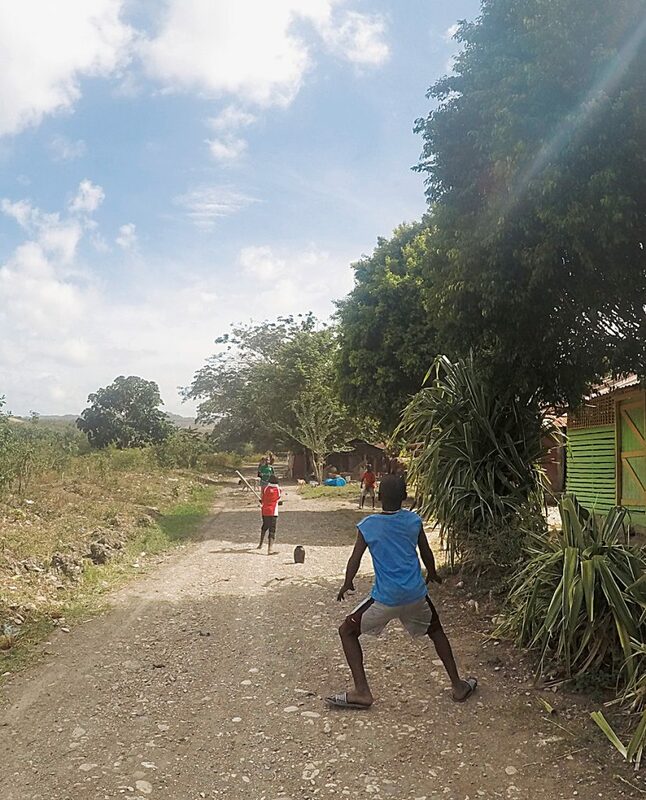 Boys play baseball in the street beside the batey in which they live. Children of Haitian migrants in the Dominican Republic face a very uncertain future, and many now live in a legal limbo. Photo: Jheison Romain. In 1983, former longtime Dominican president Joaquín Balaguer (r. 1966–1978, 1988–1996) called for the implementation of measures to stop “the Africanization of the Dominican people” in order for the population to “gradually improve its anthropological traits.” He wrote of the Haitian population as a “biological threat.” And, concerning black Haitian sugarcane workers, he asserted that “during the time they remain in Dominican territory, many of those individuals procreate children who increase the black population of the country and contribute to the corruption of its ethnic physiognomy.” Thus, negative ideas and misconceptions about Africa and blackness have been promoted from the highest echelons of Dominican society. 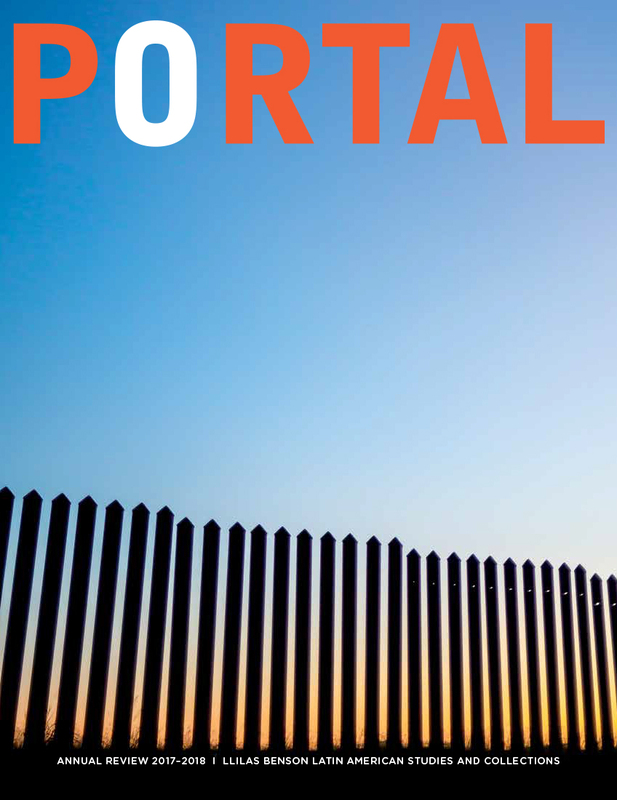 Controversially, through ruling 168-13 in 2013, the Dominican national Constitutional Tribunal retroactively invalidated the right to citizenship for people born to undocumented parents. This measure disproportionately affected the offspring of black, impoverished Haitian sugarcane workers who, as late as the 1980s, according to scholar Lauren Derby, “were imported directly by the sugar concerns as an indentured labor force.” A separate “national regularization plan” was also set in motion, through presidential decree 327 of 2013, with the express purpose of regulating the presence of undocumented foreign immigrants. This process also primarily impacted black Haitian immigrants. As was documented by local press, foreign immigrants who were not Haitian and black were given priority in the process and were allowed to skip the otherwise long lines to present their documents. Although both measures were colorblind on the surface, their application and impact was racialized. In other words, it is likely that the intent of these measures was to exclude people who are seen as black, people who, because of their blackness and their African heritage, are marked as undesirable for the nation. 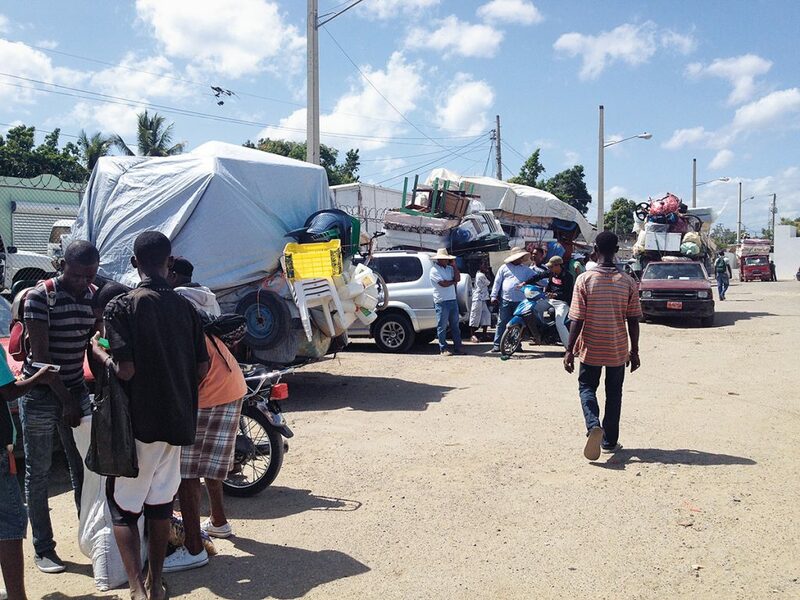 Mass exodus of Haitian migrants in Dajabon, at the northern border of the Dominican Republican and Haiti. In a matter of weeks, 40,000 Haitian migrants left the D.R. to avoid facing sudden deportation. Photo: Jheison Romain. In response to international uproar following the 2013 constitutional tribunal ruling, the Dominican congress approved a law that would allow some Dominicans of Haitian descent to regain their citizenship. However, their rights were not fully restored. Instead, as activist Ana Maria Belique noted, the government created a new, separate ledger in which the birth certificates of Dominicans born to parents who are not Dominican citizens were transcribed. Within two years, the people who were able to register under this law will have to apply for naturalization. Juan Telemín, a Dominican activist of Haitian descent who was affected by the 2013 constitutional ruling but has since been able to fight to have his citizenship restored, said he believes the primary, long-term concern for Dominicans of Haitian descent is that because they have been set aside, their rights could continue to be limited and their citizenship could once again be compromised at any given moment. The persistent monolithic view of Africa is evidence of pervasive anti-blackness. Given the long history of exploitation and marginalization of black people, by failing to acknowledge that anti-blackness still exists, we continue to tacitly accept the normalization of ideas and policies that exclude black people from full and equal social integration. A change in course is long overdue, and given the growth of global inequality and the worldwide migration crisis to which it has led, it is critical that we question and decolonize (“unsettle”) the ideas that continue to promote the devaluation of black lives, as well as those of other people who are racialized and deemed as less valuable. Jheison Romain is a Colombian immigrant of Haitian descent. He holds a bachelor’s degree in international affairs from the University of Georgia (2009) and has just completed a master’s in Latin American studies at The University of Texas at Austin. For his master’s thesis, Romain conducted field research with Haitian immigrants and their descendants in the Dominican Republic from May through July of 2015. Portions of his thesis were adapted for this article. A batey is a community built specifically for sugarcane cutters beside large plantations in the Dominican Republic. Law No. 285-04 on Migration would affirm that migrant workers be considered to be “in transit” and their children, thus, ineligible for citizenship. This was later contested by the Inter-American Court on Human Rights in 2005, which urged the Dominican government to uphold the right to citizenship as stipulated by the Dominican constitution prior to 2010. Guinea, Liberia, and Sierra Leone. Joaquín Balaguer, La isla al revés: Haití y el destino dominicano (Santo Domingo: Dominicana: Fundación José Antonio Caro, 1983), 45. Joaquín Balaguer and Jorge Tena Reyes, Joaquín Balaguer: Premio Nacional de Literatura 1990, Colección Premio Nacional de Literatura (Santo Domingo: Ediciones de la Fundación Corripio, 2001), 99–100. Juan Bosch, ed., República Dominicana y Haití: El derecho a vivir, primera edición, Colección Bosch Vive, no. 9 (Santo Domingo: Fundación Juan Bosch, 2014), 39. Lauren Derby, “Haitians in the Dominican Republic: Race, Politics, and Neoliberalism,” in Afro-Descendants, Identity, and the Struggle for Development in the Americas, ed. Bernd Reiter and Kimberly Eison Simmons, Ruth Simms Hamilton African Diaspora Series (East Lansing: Michigan State University Press, 2012), 53. Noticias SIN, “Extranjeros Que No Son Haitianos Entran a Oficina de Regularización Sin Hacer Fila,” June 17, 2015. Jason Margolis, “Haiti, a Caribbean Country, Is Joining the African Union,” Public Radio International, May 13, 2016. Scholars include St. Claire Drake (1993), W.E.B. Du Bois (1994), Edmund Gordon and Marc Anderson (1999), Christen A. Smith (2016), among others. Carole Boyce Davies and Babacar M’Bow, “Towards African Diaspora Citizenship,” in Black Geographies and the Politics of Place, ed. Katherine McKittrick and Clyde Woods (Toronto and Cambridge: South End Press, 2007), 21. 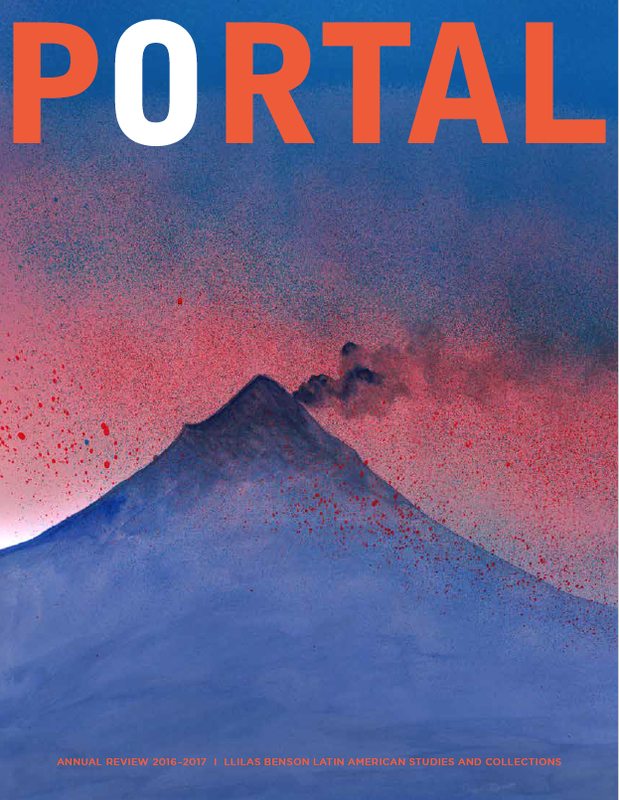 Visit our website or sign up for our bi-weekly newsletter.